Continuing the theme of cereals, but deviating from the trend of childish boxes we find ourselves confronted with this pair of unlikely sounding breakfasts. Both are exclusive to Tesco and part of a new FUEL range (which I am assured will be on special offer for the whole of November) and designed to give you a kick in the mornings. They are granolas (essentially baked muesli) and have a very similar make up including pumpkin seeds (bonus points!) and large crunchy cluster things. These are all of good quality and it's not a case of adding luxury bits to a terrible base cereal, you could eat the clusters and seeds alone and still be satisfied. Also - no sultanas or raisins which means that the flavour is still quite delicate and you can actually taste all the other bits. Their reason for existence seems to be similar to Shreddies - having a decent breakfast means you don't go hungry until you choose to eat at Lunchtime. This seems a lofty claim so I only ate this in the correct portion size of 50g to check it out. 50g of something as luxurious as this isn't much but it was enough to fill me in the morning, but I didn't notice a lack of hunger at lunchtime. I did notice the kick from the Guarana, which is a stimulant not unlike caffeine but to a lesser extent than in Mana Potion style doses, and all the extra vitamins can't hurt! This is certainly enough to get you out the front door and combined with a cup of tea/coffee certainly reduces the morning sluggishness. Who knows whether this is a placebo effect from the guy embracing the sun on the front of the box, but it seemed to work. Of the two varieties Ms. Nli10 tended towards the chocolate one and I tended towards the fruity one, but I'm happy to eat both. I don't think the contents of the base cereal are as 'luxury' as some of the cereals I've had (say a Dorset Cereal) as it lacks in variety of bits to pick at, but this is for a different crowd. I think that I picture these being bought by people who go to the Gym in the morning and those that picture themselves doing so but never quite get around to it. People will eat this and then cycle to work. There is also a Big Nutty variety which again is the same stuff but with nuts. I'll be trying that at some point too. 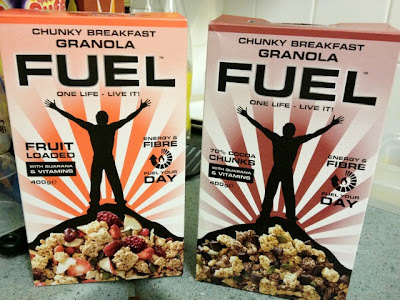 I really want to try the Fuel chocolate one, im sure i saw this advertised quite a while ago in tesco but im sure it was marketed for men..maybe theyve rebranded it.